The accommodation sector is experiencing an intense diversification phase, where establishments worldwide continue to distinguish and redefine their image by incorporating themes amongst other things to create an authentic visitor experience. The same process of diversification is also present in the cyber travel community CouchSurfing, where authenticity has a meaning that goes well beyond traditional tourism products and landscapes. CouchSurfing is an online travel community of globally minded and socially conscious community of travellers. It “seeks to internationally network people and places, create educational exchanges, raise collective consciousness, spread tolerance and facilitate cultural understanding”. It is all about seeking authentic visitor experiences while staying at other couchsurfers’ homes at any destination. Although many couchsurfers may join the community to save money on accommodation, there are many benefits that accrue to both hosts and guests. CouchSurfing is enabled by an interactive Web 2.0 Website that offers free membership to anyone, thereby facilitating social interactions amongst people. The profile page is a basic prerequisite for membership and it indicates the person’s intended level of interaction with the general couchsurfing community. This can include to “offer a couch” for sleeping or just “meet up for coffee or tea”. The profile page also shows a member’s involvement in the community over time and contains a friends list that states how a person knows others on the list. By clicking on someone’s profile page, it is possible to see whom he or she has hosted and when, where he or she has traveled and with whom they stayed at each location. Couchsurfing communities at any given destination organize a range of social activities such as parties and get-togethers where live interaction takes place between members who have not had prior personal contact via email or the community’s Website. 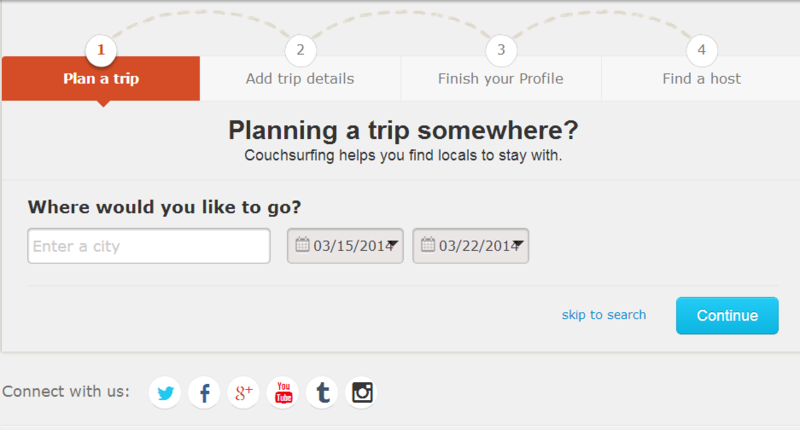 When couchsurfers travel, they contact other members at their destination and request accommodation on their ‘couch’. The latter is a term used symbolically to represent any private space provided for an overnight stay in the home of a couchsurfer. The average length of stay is 2 to 3 nights per host and a visit of a week or more at the same destination is usually spent at different hosts. This may be alternated with hostels if no host is available. CouchSurfing became publicly accessible in January 2004 and by January 2008 it counted over 400 000 members, making it the largest community of its kind in the world. Website statistics show that couchsurfers are predominantly from industrialized countries with Europe representing approximately half and North America around 30%. On a country basis, the United States of America accounts for about a quarter of all members worldwide. Couchsurfing is clearly a male-dominated activity, as females represent just under 40% of all members. Couchsurfers are also young: 70% fall in the 18-29 age group and the average member age is 26. CouchSurfing strives to build connections worldwide that create and strengthen (inter)cultural understanding because members seek deep intense experiences linked to discovery. Based on a survey of 3000 members, over half (56,21%) of all respondents are motivated to learn about themselves and the world around them via meeting like-minded strangers at their destination. As an organization CouchSurfing provides its members with a series of practical tips to facilitate safe lodging and it also provides advice to members to build awareness about staying with members in the event of problems. Except for some technical staffers who maintain the Website, CouchSurfing is entirely run by volunteers where some members have particular responsibilities within the organizational structure of the community. There are around 700 ambassadors worldwide who organize gatherings and activities that attract both local and travelling couchsurfers. In Montreal, couchsurfers are known to organize larger meetings that coincide with international festivals and these gatherings vary in duration, location, size and member composition. After Paris, Montreal has the second largest local couchsurfing community in the world, although this position is presently rivaled by London. As couchsurfers stay with other couchsurfers, they are excluded from official accommodation statistical counts, but nonetheless they are still important contributors to local economic activities. They visit tourist attractions, participate in a range of cultural activities and frequent bars and restaurants just like regular tourists. The biggest difference is that, with the help of their local hosts, they are likely to visit places off the official tourist map in their search for the authentic visitor experience. Thus, their economic contribution is likely to include the consumption of products and services outside the realm of the average visitor. CouchSurfing is a product of modern tourism in the age of mobility and it regroups the Internet-minded and the globally networked. It is a form of tourism that moves travellers away from the simple consumption of traditional tourism spaces and it also changes people’s expectation of a memorable visitor experience. Although they may have similar travel patterns compared to regular tourists, couchsurfers are likely to be more responsible towards the host community and their local environment. Given that the majority of couchsurfers seek the authenticity of their destination by by building deep emotional connections to places through personal contacts, the role of the traditional tourism landscape becomes less important. This means that iconic tourist attractions and spaces become secondary and social interactions as primary, if not the core of the visitor experience. However, the very essence of seeking out ordinary private spaces and new local people at a destination means that any place on the planet can become a potential couchsurfing haven. Given the direction of global telecommunication patterns and the general expansion of the travel sector, communities like CouchSurfing will continue to exist and grow. Consequently, there may be an increase in spin-offs, resulting in smaller communities that are more specialized and suited to the needs of those users in search of yet a different experience. This article was written with the collaboration of Joris Sprakel, a lawyer and CouchSurfing ambassador for the city of Amsterdam in the Netherlands. – Bialski, P. (2007). Intimate Tourism. Friendship in a state of mobility – the case of the online hospitality network. Master’s Thesis. Institute of Sociology. Department of Social Psychology. University of Warsaw, Poland. 85 pages. – CouchSurfing (2008). Website: http://www.couchsurfing.com/ Last accessed January 23, 2008. – Hospitality Club Website: http://www.hospitalityclub.org/ Last accessed January 23, 2008. – Global Freeloaders Website: http://globalfreeloaders.com/ Last accessed January 23, 2008. – Péloquin, C. (2007a). “Facebook, the new darling of Web 2.0,” Tourism Intelligence Network, UQAM, September 6, 2007. – Péloquin, C. (2007b). “What is Facebook’s impact on the tourism industry?” Tourism Intelligence Network, UQAM, September 21, 2007. – Servas International Website: http://joomla.servas.org/ Last accessed January 23, 2008. – United Nations World Tourism Organization (2008). http://www.unwto.org/frameset/frame_sustainable.html Last accessed January 23, 2008.